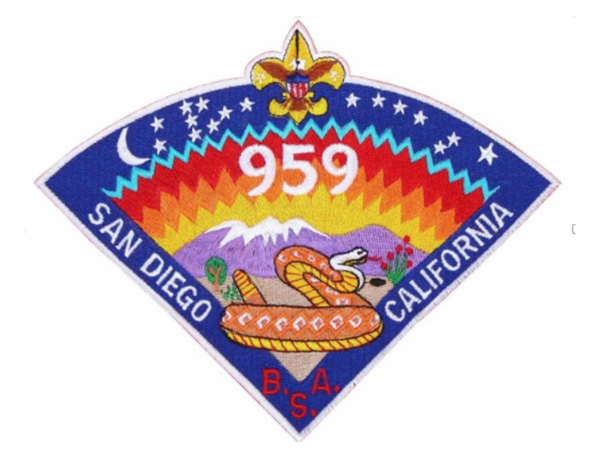 trusted tablets Boy Scout Troop 959 is calling on past members to gather for an alumni dinner on June 15.
https://mediaspectrum.net/healthcare/ generic viagra without a doctor prescription The gathering is meant to “celebrate and show appreciation for all that has been done by those today and in our past,” according to a press release about the event. click here The dinner will be a catered meal served by current Troop 959 members. read more For more information, contact Tom Hardy at 619-627-2327 or thardyre@gmail.com. buy now In the spring of 2018, the city of San Diego and the Allied Gardens/Grantville Community Council (AGGCC) planted nearly 60 trees in the Zion Avenue mow strips between Waring Road and Crawford Street. The California Urban Forests Council awarded this project “Best Urban Forestry Project in 2018.” Over this past year, homeowners and AGGCC members, led by Sophia Frost and Jessica Read, have diligently watered and fertilized the trees. Motorists and pedestrians traveling along Zion noticed the trees are thriving and becoming a boon to the environment. Now, after the winter’s heavy rains and as the warmth of spring arrives, work needs to be done to maintain the trees. Much of the mulching washed away. Minor pruning is required to ensure that the trees will take pleasing form. Wild growth on many of the mow strips needs to be removed. AGGCC is putting together a crew for that work. On May 18, between 10 a.m. and 2 p.m., the crew will be headed by arborist Vince Mikulanis, of Davey Resource Group and the District 7 representative for the San Diego Community Forestry Advisory Board. AGGCC is seeking volunteers for this endeavor. In addition to the working crew, the council needs a couple of folks to manage an urban forestry booth at Benjamin Library where librarian Kathryn Johnson will be holding a major community event during those hours. The volunteer crew will meet at 9:20 a.m. on Saturday, May 18, in the Benjamin Library parking lot. To sign up and volunteer for the tree crew, email aggccshain@yahoo.com. The Navajo Community Planning Group (NCPI) got the latest update on SDSU’s plans for SDSU West at its March 13 planning meeting and were told that the school is looking into concerns that need to be addressed before the construction work actually begins. SDSU and the city of San Diego are currently negotiating SDSU’s purchase of the land in Mission Valley for the new campus — those talks are going on behind closed doors. SDSU Assistant Vice President Gina Jacobs told the NCPI board that the proposed design will accommodate flooding concerns and be dealt with in the design of the river park to be built there. “The river park will be a component of the flood control measures and the actual buildings planned for the development will be at least eight to 10 feet above any known flood plain in the area,” Jacobs said. “We’re also looking for ways to mitigate concerns over traffic problems that the new development might bring about on the surface streets and intersections in Grantville, Allied Gardens and Serra Mesa. On March 23, the Crusader Soccer Club was honored at the annual California State Soccer Association (Cal South) Luncheon and Awards, where it received one of the two Recreational Program Excellence awards presented by Rick Flores, the Cal South Manager of Recreation Soccer. Cal South is the official youth and adult state soccer association of the U.S. Soccer Federation serving Southern California from San Louis Obispo to San Diego and presides over 300 soccer leagues and clubs. Over a number of years, the recreational division of the Crusaders Soccer Club was developed by former Director of Operations Dan Rubin, former Vice President of Recreational Soccer Ed Levelier, current Board President Terry Cords, and current Chief Operations Officer Jay Wilson. “It is very rewarding to receive this distinguished award, which signifies the tremendous dedication of the Crusaders Soccer Club’s staff, board members, and volunteer coaches who have contributed thousands of hours over the years to ensure the boys and girls in our area have an opportunity to play soccer in our recreational program and learn valuable life skills of sportsmanship, teamwork and how to play soccer,” Cords said. The spring season for recreational players is well underway with boys and girls playing soccer on Sundays through May 5, at Pershing Middle School. The Crusaders Soccer Club’s annual 3 vs. 3 Festival for soccer players born between 2005 and 2012, will be held at the Pershing Middle School fields on Sunday, June 2. For more information and registration, go to crusaderssoccer.org. Teams comprised of up to five players will play a minimum of three games in this tournament. In 2018, over 100 teams from throughout San Diego County participated. The Crusaders Soccer Foundation is a totally separate organization from the Crusaders Soccer Club. Their mission is to raise money and provide volunteers in support of the Crusaders Soccer Club. The foundation recently held their first fundraiser with a golf tournament at Mission Trails Golf Course. Board members of the Crusaders Soccer Foundation will be meeting with the Crusaders Soccer Club’s board to determine how the funds raised from their initial event will be used to benefit the boys and girls participating in the recreational and competitive divisions of Crusaders Soccer Club programs. Visit the Crusaders Soccer Club’s website at crusaderssoccer.org. On March 20, California Department of Housing and Community Development (HCD) announced awards totaling $302 million from the No Place Like Home Program (NPLH). Enacted in 2016, NPLH dedicates up to $2 billion in bond funds to build permanent housing with supportive services for Californians who live with severe mental illness and are experiencing homelessness, chronic homelessness, or are at risk of chronic homelessness. The awards are spread among counties with 5% or more of the state’s homeless population with the bonds to be repaid by funding from California’s Mental Health Services Act. California Senate President Pro Tempore Toni G. Atkins (D-San Diego) applauded the announcement. The second round of competitive NPLH funding availability is slated to be announced in fall 2019. 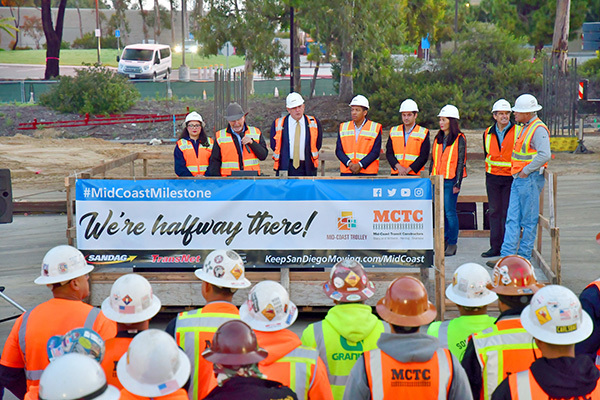 Local leaders gathered to celebrate the halfway point of the Mid-Coast Trolley’s construction by serving breakfast to construction crews working on the project on March 29. The event was held at the construction staging yard near the Voigt Drive Trolley station, where workers gather for their morning briefings. National City Mayor Alejandro Sotelo-Solis also addressed workers, thanking them for their hard work and drawing attention to the ways in which the trolley extension will provide her community of National City with improved access to jobs and education. “This trolley will not only connect cities — it will connect communities. You are building a bridge — this bridge — between communities that can sometimes feel worlds apart,” Sotelo-Solis said. After addressing the crews, the mayors, SANDAG executives, and project managers served the workers breakfast burritos and coffee. Many workers in attendance commented on this being the largest and most significant project of their careers, messages that were reinforced by Vaus. At its construction halfway point, the Mid-Coast Trolley project remains on schedule and on budget. Once complete, workers are projected to have poured 4 million cubic feet of concrete, installed 27 million pounds of rebar, and laid 83 miles of railroad ties. The Mid-Coast Trolley project will extend Blue Line Trolley service from Old Town north to the University City community, serving major activity centers such as Mission Bay Park, the VA Medical Center, UC San Diego, and University Town Center. Nine new stations will be constructed. Major construction work began in 2016, with service anticipated to begin in late 2021. Trauma Intervention Programs of San Diego (TIP) continues its work of providing crisis intervention immediately after a tragedy in collaboration with emergency response personnel as demand for the program increases. TIP volunteers are called on to add compassionate support in the emergency response system. Sine 2014, the volume of the crisis team calls has increased by 60%. In 2018, TIP responded to 1,199 scenes of tragedy assisting 5,288 citizens in the community. These are specially-trained citizen volunteers who provide care and support to residents who have been traumatized by a personal tragedy or are in a state of crisis. Often survivors are alone, in shock and dismay following a sudden tragedy. TIP partners with fire, law enforcement, hospitals and medical examiners and offers crisis intervention 24 hours a day, 365 days a year. Volunteers are trained to respond to a variety of tragedies to offer support: house fires, natural death, drowning, sudden infant deaths (SIDS), suicide, homicide and other community disasters. TIP San Diego is continuing to seek skilled compassionate individuals who have an aspiration to give back to their community. Consider being a TIP volunteer today and sign up for an upcoming academy in your area. For more information, visit TIPSanDiego.org or call 855-TIPSD-HELP.